Wow, what a morning! 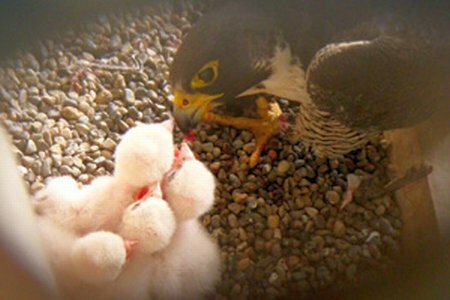 If you watched the action unfold on the cameras or on our 2008 Banding Day page, you were able to follow along as we welcomed Seneca, Diamante, Quest, Zephyr and Susan B to Rochester with names and ID bands. If not, go back and read the 2008 Banding Day page. There you’ll find information on each of the eyases, including their names and ID band numbers! For the Rochester Falconcam crew the day began at 7:30 with Kenn, Jim, June and Carol arriving to check the camera set up and make sure all of the preparations were in place for the arrival of our guests. Lisa McKeown and Grace Tillinghast stood by ready to greet the media and others as they arrived. 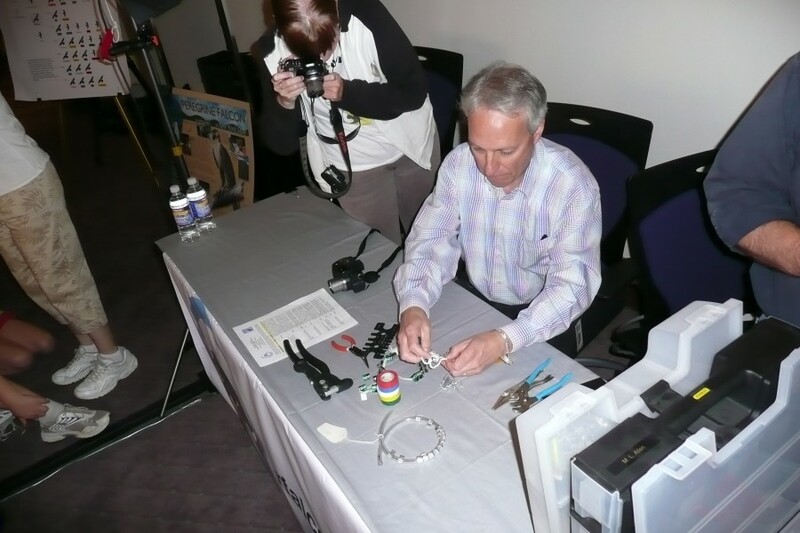 Mike Allen and Barbara Loucks of the DEC arrived shortly after 8:00 and began setting up the banding table with able assistance provided by Kodak’s Tom Hoehn. Tom’s an old hand at this– he’s been to eleven bandings! 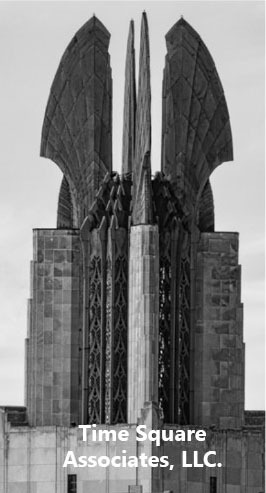 As soon as the students and other guests arrived the extraction teams headed up to the top of the Kodak Tower. They reported that Mariah was very aggressive and territorial, striking the hard hats of several team members. They worked quickly while Mariah yelled and made repeated attacks. Kaver sounded the alarm too. He flew circles around the tower, coming close but never attacking as Mariah did. Later everyone agreed that Mariah just keeps getting more and more aggressive with each passing year. 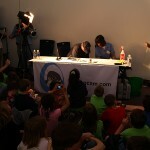 Of course the students from the Hilton Quest school were very excited to see the eyases when we brought them in. 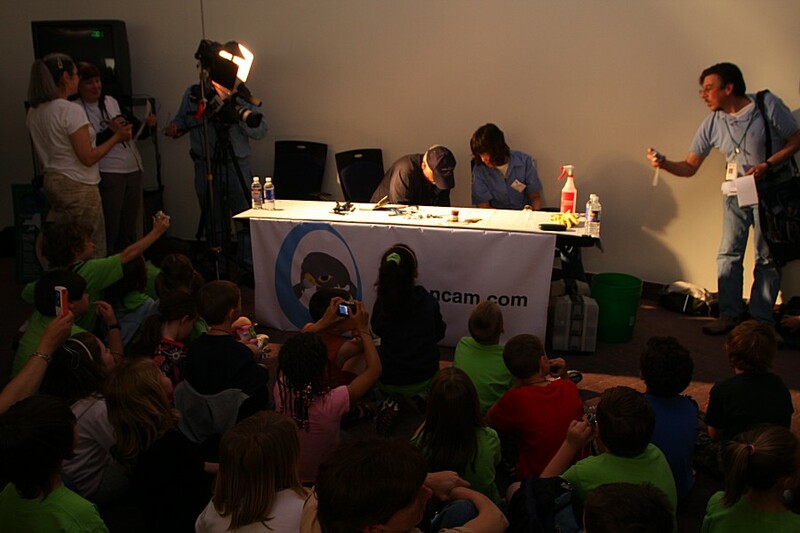 Local media were also on hand to record the event, while June and Carol announced the names for each eyas and recorded them on the official Rochester Falconcam Eyas Naming Chart. 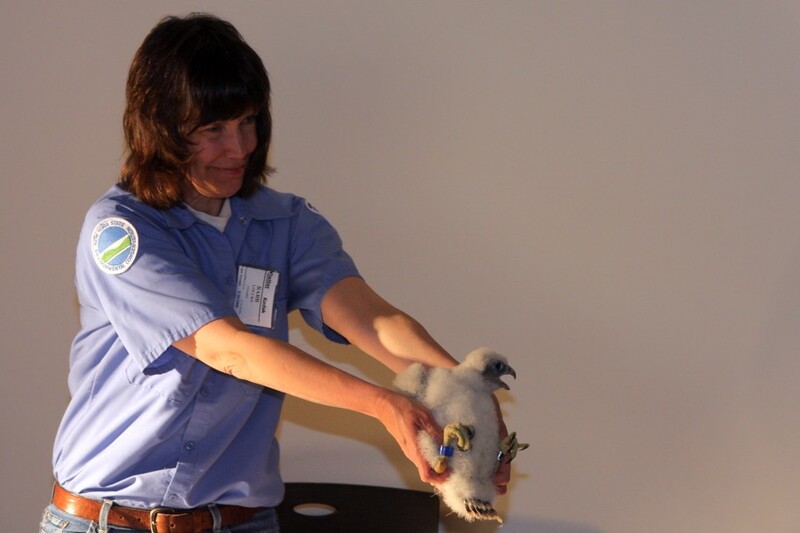 Here’s Seneca, the first falcon to be banded. Mike Allen decided that she’s a female, but “a small one”. June and Barbara Loucks talked to the children about the size difference between male and female falcons and answered some questions while she received her bands. Afterward, Seneca took a short tour outside so that all of her adoring fans could get a look at her! Next up was the smallest of the group, Diamante. You can see Mike Allen holding Diamante’s head as he performs a short examination. Mike was impressed that the eyas followed his every move, a very good sign! Diamante was the quietest of the eyases during his banding too. Maybe he was tired from all the food he received before getting yanked from the nest box! Quest, on the other hand, was a real talker– or maybe I should say “squawker”. The Quest school students were thrilled to hear their name announced for this big female. 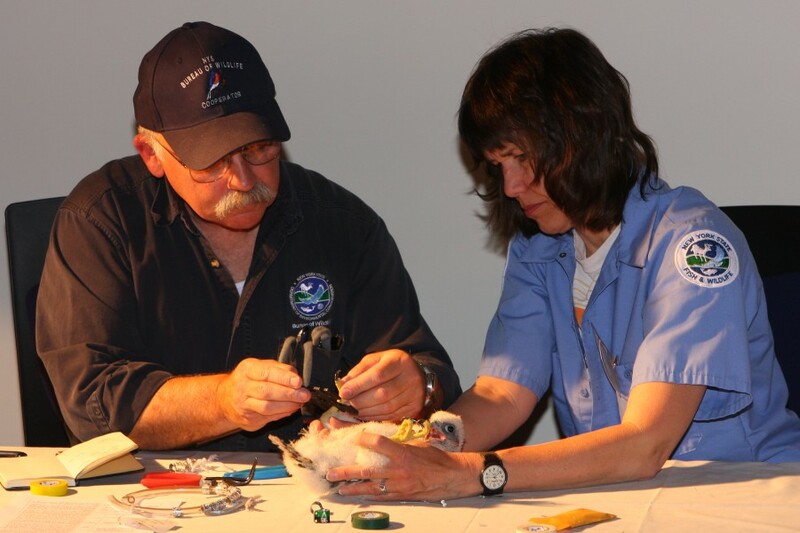 She was especially noisy when Mike was applying the colored tape over her US Fish and Wildlife Service band. Mike said she was yelling because she didn’t like blue, the color of the tape he was using for her. Then it was Zephyr, the second young tiercel, who received his bands. 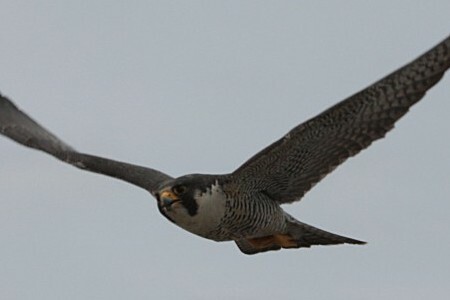 Zephyr’s name carries forward the popular theme of naming the Rochester falcons after winds. Since his name was submitted by the members of the GVAS volunteer Fledge Watch, we think he’ll definitely have a place in the watchers’ hearts! Last up was Susan B. As soon as they brought her to the table the students all knew she was a female. They turned out to be quick learners, and they were right! 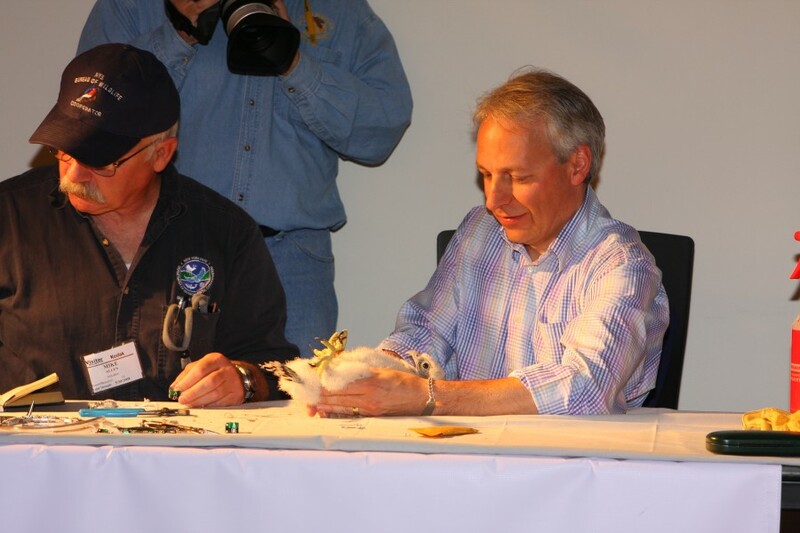 Tom Hoehn even got in on the banding act, standing in for Barbara Loucks to assist with the final banding. Susan B was named by the City of Rochester, and her name is meant to commemorate one of Rochester’s most prominent citizens, as well as to honor the city itself. We were thrilled with all of the names that were submitted, and we can’t wait to see this group of five fine eyases take to the air in a few weeks. Finally it was time to finish the banding task. 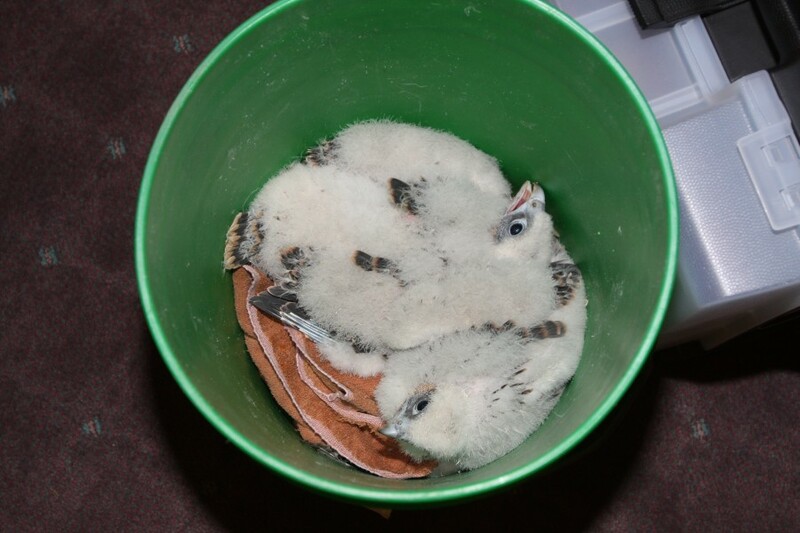 The young falcons were carefully placed back into the specially designed Eyas Transport Pods– better known as five-gallon buckets– for the trip up to the nest box. Putting back the eyases takes much less time than removing them, but it still gave Mariah plenty of opportunities to voice her displeasure at the presence of humans in her territory, and she attacked with as much vigor as she had an hour before. With the eyases safely back in their scape the Eyas Return Team retreated. 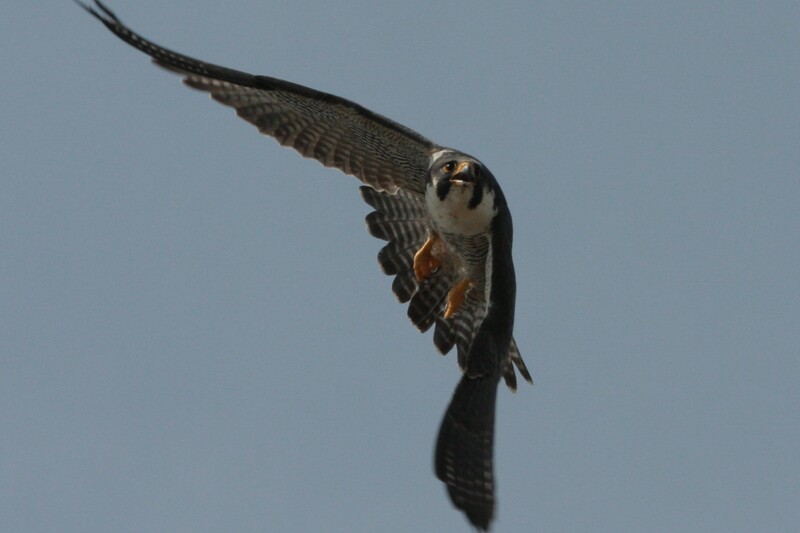 This eleventh year of banding the Rochester Falcons was the best yet. Five robust, healthy eyases, terrific names, engaged school children and a wealth of guests all contributed to an excellent morning. The Rochester Falconcam would like to thank Barbara Loucks and Mike Allen for taking time from their very busy schedules to spend a morning with us. 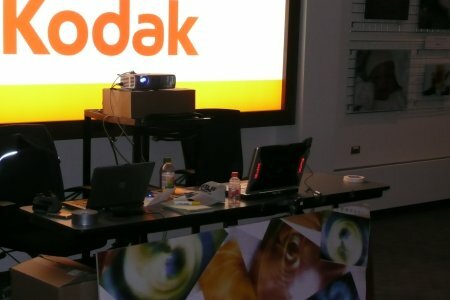 We’re also grateful to Kodak for hosting the banding event in the style we’ve come to expect and appreciate. And finally, many thanks to all of the fans who viewed the banding, whether in person or on the Internet. We all feel very privileged to take part in each year’s Banding Day, and we’re glad you could share it with us! 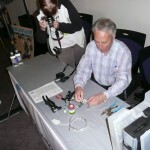 For another look at the banding, check out Tom Hoehn’s post in Kodak’s 1000 Words blog! You can also view some video clips from the banding posted by Baerbel at YouTube! Banding Day is Nearly Here! 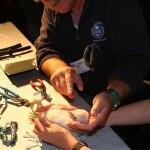 The team at the Rochester Falconcam has been hard at work preparing for Banding Day, and everything is coming together. Just like last year, we’ll provide updates at Imprints as the banding action unfolds. 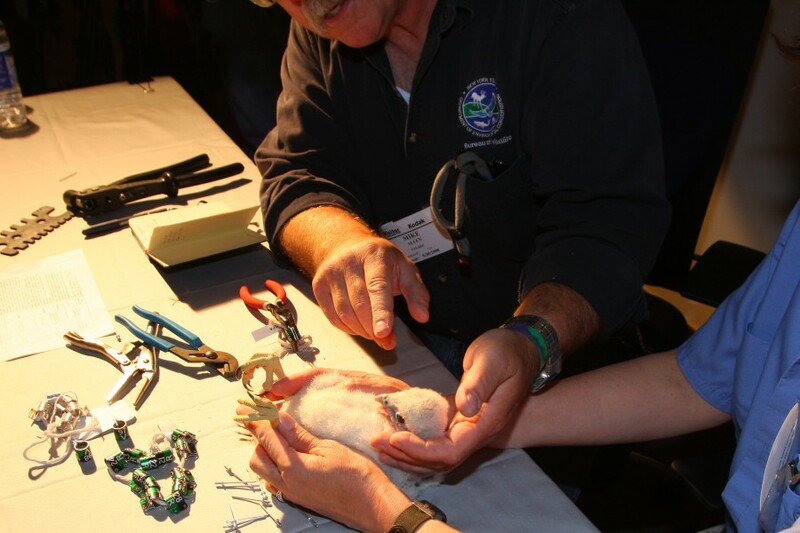 Catch it all on our 2008 Banding Day page! The page will be activated on Friday morning as soon as we get the banding activity under way. Our guests should start arriving around 9:30 Eastern Daylight Time on Friday morning. If everything goes according to schedule we should begin removing the eyases from the nest box just before 10:00 AM. Of course, we’ll be operating on “Mariah Time”, so we can’t guarantee that we’ll get the timing exactly right! Banding Day is one of our busiest days, so be sure to click your Internet browser’s Refresh button often to see the latest updates on the Banding Day page, and be patient while the pictures are loading. We’re very excited about the names that have been submitted for this year’s young falcons, and we can’t wait to share them with you. 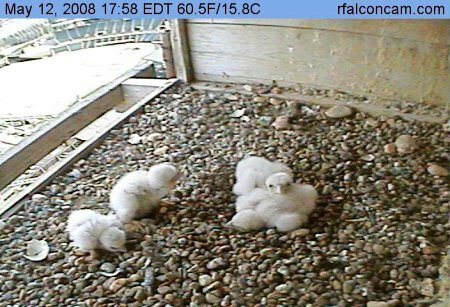 We’ll also be providing views of the banding on the Rochester Falconcam’s Multiview page. If you miss the action Friday morning, don’t worry! We’ll publish a review of the day’s events at Imprints so you can catch up. Welcome to Falcon Watching HQ! 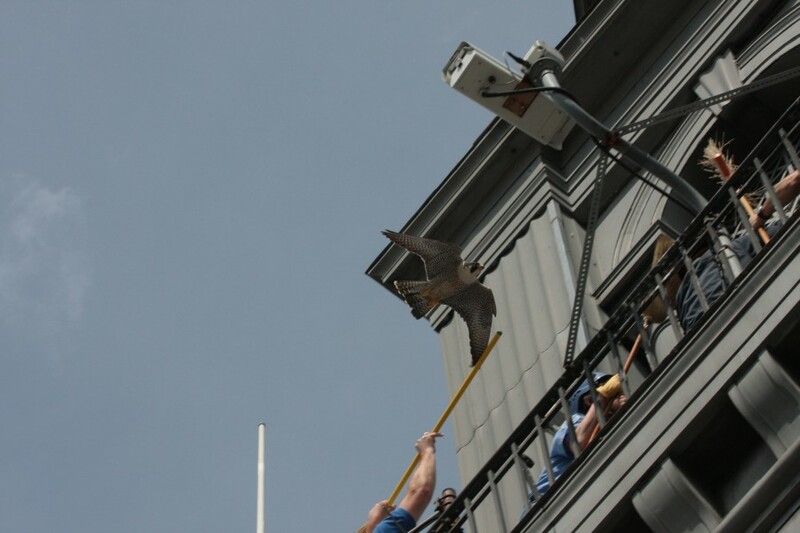 Thanks to our friends at Kodak, falcon watchers now have a place to sit and watch Mariah, Kaver & their fledglings as they fly around the Kodak tower, and to get some shade during the hot summer months! Falcon Watching HQ has been set up in the Kodak Visitor parking lot at the corner of Morrie Silver Way and State Street. There are bleachers with plenty of seating and a canopy provides a shady spot to get out of the sun. Signs on the canopy let passers by know about the Falcon Watch and the Rochester Falconcam. Tom Hoehn, Kodak’s Director of Brand Communications and New Media will be well known to many of you as the manager of the Kodak Birdcam for many years. Tom’s undying dedication to the falcons and implacable determination were instrumental in getting this viewing area set up. He and David Featherman from Kodak’s Facilities department installed the bleachers and canopy this morning. Tom provided the collage at the left to chronicle the work that went into erecting the viewing area (click the small image to open the full-sized picture). The Rochester Falconcam and all of the Falcon Watchers want to thank Tom, David and Kodak for their generosity and support! The viewing area will be in place through the middle of July, when the fledglings are expected to begin leaving the area. It is open to the public and anyone who wants to find a comfortable place to watch the falcons while they’re on the Kodak tower. Plans haven’t been finalized yet but we’re working to see if we can have experienced watchers available at the viewing area to answer questions from passers-by. 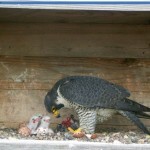 So come downtown and spend some time watching Mariah and Kaver at Falcon Watch HQ! Just a week after the last of Mariah’s five eggs hatched, all of the eyases are thriving and growing like weeds! Feedings occur several times a day, as often as every 1½ to 2 hours. The two pictures below illustrate just how much they’ve grown. The picture on the left was taken on May 12. The one on the right is from earlier today. You can see how much bigger the eyases have gotten. 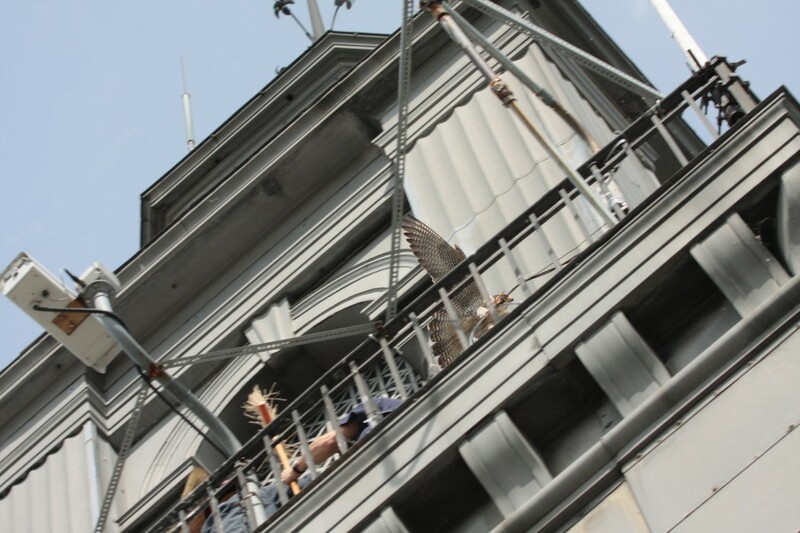 Look closer at the picture on the right and you’ll see a layer of darker heavier down feathers coming in. The young nestlings’ metabolisms are also maturing, allowing them to regulate their own body temperatures. That’s means Mariah and Kaver can leave them uncovered for relatively long periods while they both go out hunting. With both parents hunting their chances of catching food increases, and at the same time they’re able to supply more food to their rapidly growing eyases. The chicks will continue their amazing growth rate for another five weeks or so. By the time Banding Day comes, they’ll be more than halfway to their fully grown size. When they leave the nest near the end of June, the eyases will be as big as their parents! Speaking of Banding Day, we’ve set the date! Mark your calendars for Friday, May 30th. Sometime around 9:30AM we’ll get started. 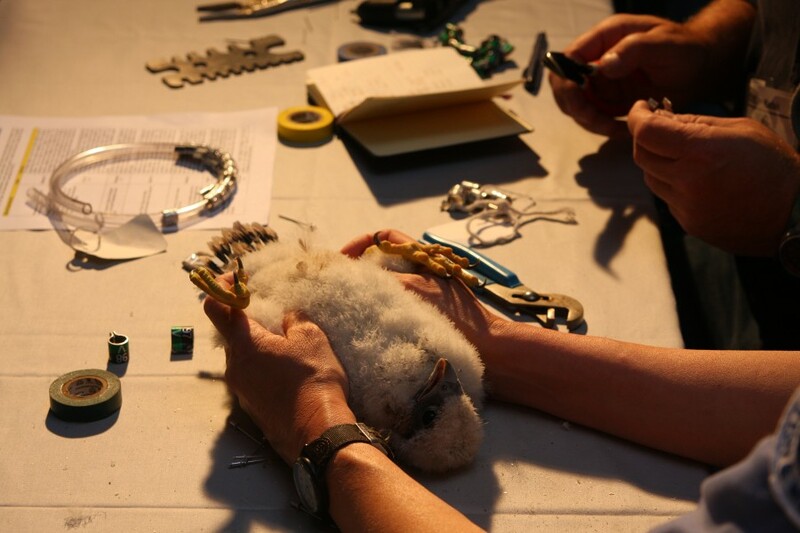 Traditionally Banding Day is the high point of the Rochester Falconcam season. 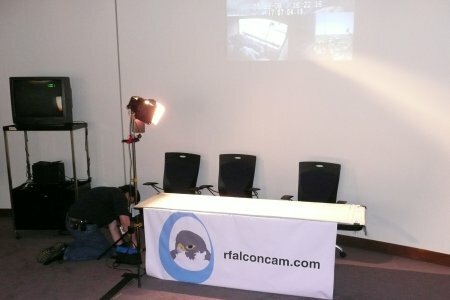 We’re still putting final details in place, but we expect to follow the winning formula we’ve used in past years, including bringing all the action to you as it happens on the Rochester Falconcam’s cameras. And how will the eyases get their names? 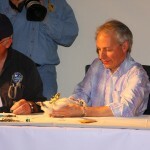 For 2008 we have decided to invite a number of deserving groups to submit names for the hatchlings. We’ll update you with more information as the date gets closer. In other news, this year’s falcon watchers can get a great view of the nest box and take a break from the sun! Kodak, Rochester Falconcam’s partner, has purchased a covered canopy and seats that will be installed in the Kodak parking lot at the corner of State Street and Morrie Silver Way. We’re grateful for Kodak’s generosity and their willingness to provide a comfortable spot to watch all the fledgling action this year. 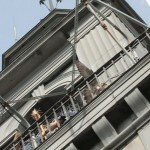 The canopy is due to be installed around the end of May. 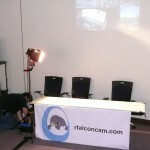 As soon as it’s ready we’ll bring you more news and share some pictures of our new Falconcam Watchers HQ! We’ve recently added some new clothing and merchandise to The Scrape, Rochester Falconcam’s online store! Our Spring 2008 collection includes shirts in two new designs that feature last year’s four fabulous fledglings, Ananta, Grace, Linn and Sacajawea. New mugs and mouse pads are available in our Stuff for Home section too! Head over to The Scrape and check it out. Proceeds from all your purchases go to support the Rochester Falconcam! And here’s a sneak preview… We’re working to bring you some new and exciting merchandise choices including high quality embroidered clothing, office, travel and gift items! 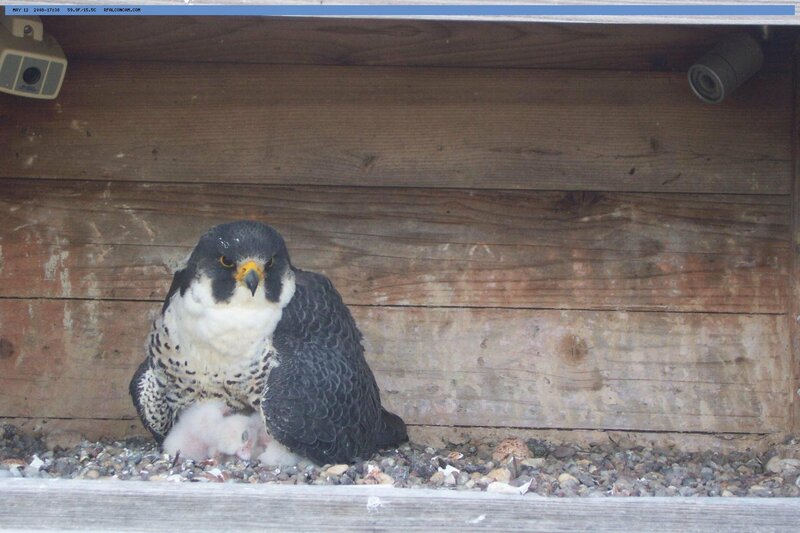 Linda Woods of the Canadian Peregrine Foundation reports that Rhea Mae’s fourth egg hatched yesterday (May 12)! 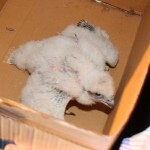 It was a few days behind the other3, which hatched before the weekend. 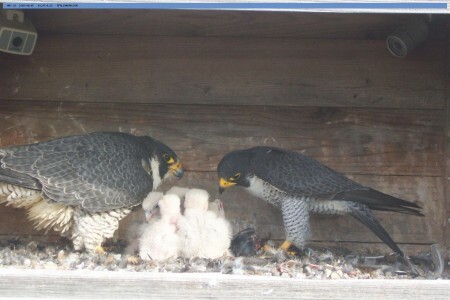 There was some speculation that the fourth egg may not have been viable– a normal occurence with new Falcon mothers. We’re pleased to report that all four eyases appear healthy and active. Way to go Rhea Mae and Tiago! A group of Falconcam team members and fans are already planning a trip to Toronto in a few weeks for an in-person look at Mariah’s extended family. Freedom and new mate Millie now have their own observation page on the CPF Website! It features pictures and nest site observations going back to 2005. 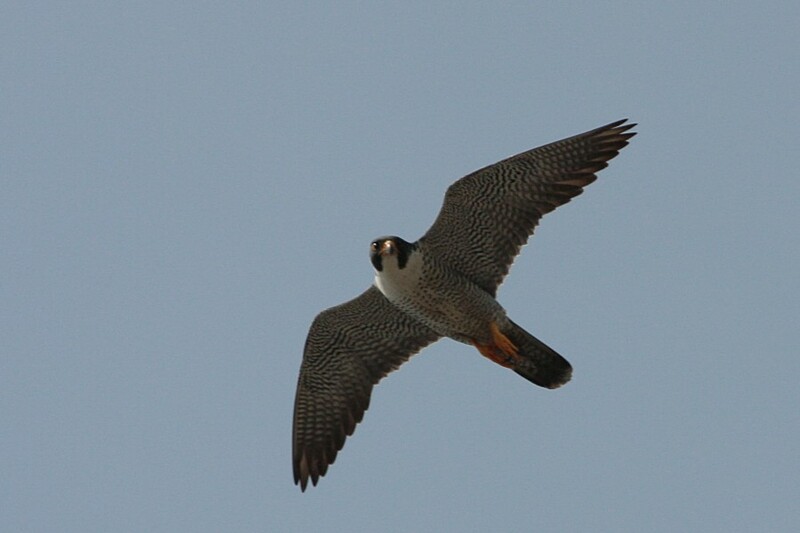 From nest watcher Doug Garbutt comes word that a third juvenile Peregrine was recently spotted near the nest box before being driven away. Perhaps due to the additional stress from this encounter, Millie was observed eating one of her three eggs, possibly after it was damaged during the territory dispute. She and Freedom continue brooding the remaining two eggs. The estimated hatch dates for these eggs was May 10-12. They’re a little late, but it’s still possible hatching will occur. UPDATE 14 May – One of Freedom and Millie’s eggs has hatched! Second Clutch for Ranger & Hunter? 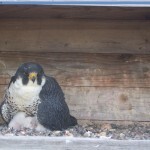 Recent news from Ranger’s nest monitor Harry Crawford at the Canadian Peregrine Foundation indicates that Hunter and Ranger may be starting a second clutch of eggs at their new nest site. 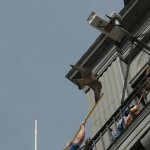 Hunter flew from the CIBC building in one great stoop and landed on the north-most balcony on the east side of the Four Seasons Hotel. He faced inwards and vocalized. Moments later, Ranger appeared from the floor of the balcony and Hunter took her place. NEST ANYONE! This is behavior typical of birds that are having a brooding shift change, so it’s possible that Ranger has started a second clutch of eggs. She has done this in years past following the failure of her first clutch. Unfortunately, repeat clutches have failed to hatch as well. We’re all hoping for a change in Ranger and Hunter’s fortunes this year! 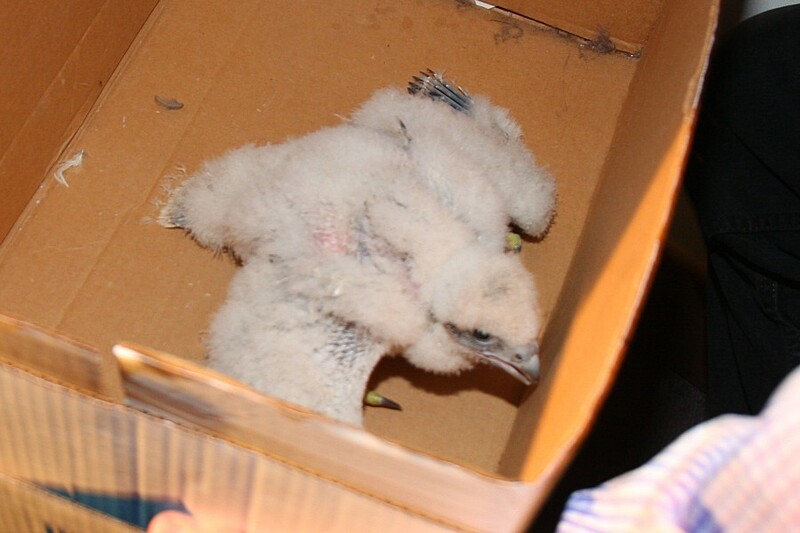 Even though they’re only a few days old, the young falcon chicks are already proving their Peregrine heritage, “wandering” around the nest box. Mariah and Kaver are spending much of their time keeping the eyases covered, but the weather is mild in Rochester so leaving them uncovered for a few minutes at a time is OK. Nevertheless, the adults don’t let the young ones go to far before corraling them again. 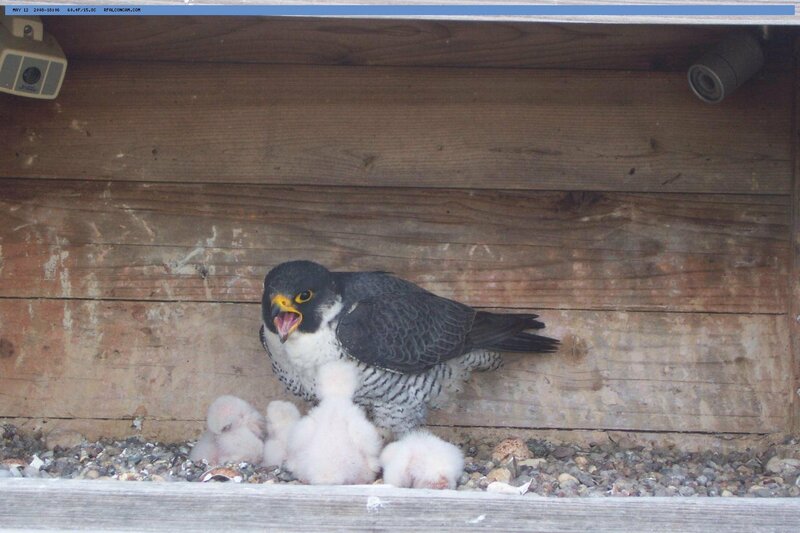 Kaver’s expression in the picture at the left makes you wonder what’s going on in the nest box! After about ten days the eyases will grow a second coat of heavier feathers, and at the same time they’ll mature enough to allow them to regulate their own body temperature. But for now they rely on Mariah and Kaver to keep them in “Baby Bear” temperate conditions– not too hot, not too cold. To do that, Mariah or Kaver gather all the eyases beneath them and lower their wings to keep the wind away and concentrate their body heat. For all their wandering, the nestlings will spend most of their time clumped together in a “Peregrine pile”, the better to keep each other warm. In order to grow those feathers, and just to grow up, these chicks need to eat– a lot! They’re being fed every couple of hours. They even wake up in the middle of the night for an early morning snack! Here’s Mariah with some food for the always hungry eyases, caught in the instant of landing by the Rochester Falconcam’s cameras. 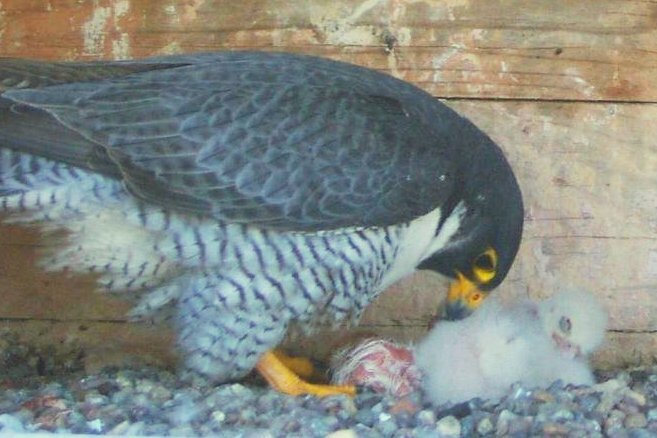 Now that hatching is over, look for updates on some of Mariah’s past offspring in the coming days, plus news about naming the eyases, banding day, and maybe even a little about Peregrine behavior and biology. 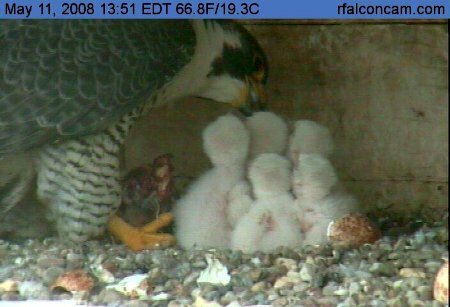 Just before 2:00PM today we got a good, clear look at all five eyases as they were being fed. Five little white heads are clearly visible in the picture above, as you can see. Yesterday after posting about the fourth and fifth hatches, we spent the rest of the day second-guessing. 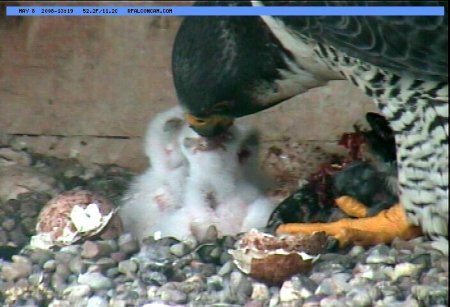 Many viewers of the Falconcam thought that only four had hatched, mostly because no one could see five eyases at once, and there continued to be a large intact egg shell visible among the pile of hatchlings. There is some evidence to suggest that the remaining shell was in fact a whole egg that hatched around 9:00AM today. As good as the view is, the Falconcam cameras don’t always give us as clear an image as we’d like. We also have to work from still photos taken a minute apart, so there’s a lot of movement going on in the scrape that we can’t see. So all in all, we’re not opposed to the idea that we mis-identified the fourth hatch (and by extension, the fifth) yesterday afternoon. One of the great joys of watching the Rochester Falconcam, even for those of us on the “inside”, is being surprised. Today we received the most pleasant and exciting kind of surprise: Proof positive of five healthy-looking eyases for Mariah and Kaver! Five Eyases for Mariah and Kaver! 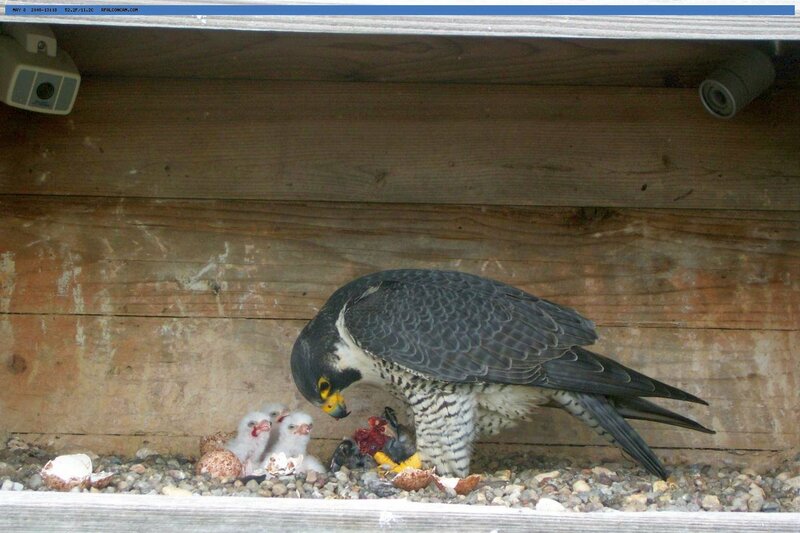 It looks like sometime around 3:17 this afternoon Mariah’s fifth egg hatched! Here’s a look at the newest hatchling, being watched over by Kaver– it’s the pink object just in front of his big yellow feet. 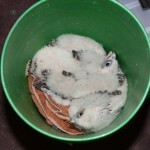 The eyas’s feathers are still matted and moist, but they’ll dry and fluff up quickly. 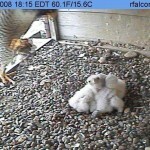 We at the Rochester Falconcam can’t think of a better way to celebrate Mothers Day. Congratulations to Mariah and Kaver on their outstanding family of five! 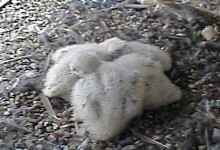 It’s hard to see, but this is the clearest picture we’ve had yet of what looks like the fourth eyas to hatch. If you look carefully, one eyas is sleeping at the left, and there are three open beaks in the group to the right. 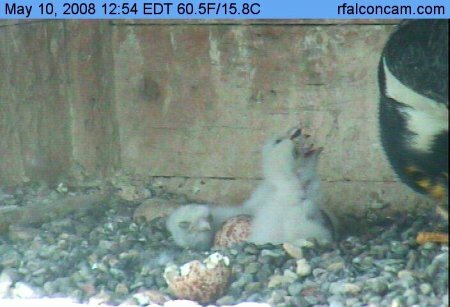 Based on the fact that all the eyases appear to be feeding and they all have fluffy dry feathers, the fourth eyas likely hatched earlier in the morning. Most certainly it was well before the Falconcam cameras captured this shot just before 1:00 this afternoon. Mariah’s being spending a lot of time covering the hatchlings so getting a clear look isn’t easy, but if you keep watching the Falconcam you may be able to get a good look at all of the eyases! As we noted, the young eyases like to be fed. Here’s the first view of all three being fed by Mariah. Click the thumbnail at the left to see a full-sized image of the feeding courtesy of the Falconcam’s High Resolution Kodak digital camera. 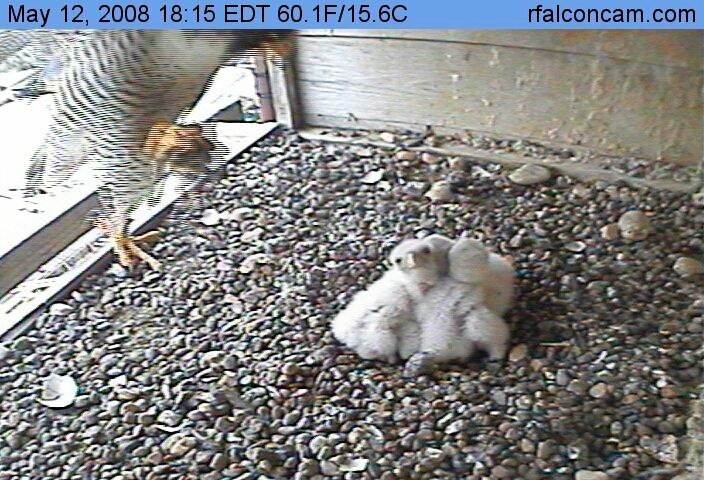 These are exciting times here at the Rochester Falconcam. We’ll try to bring you pictures throughout the day. We’re a dedicated bunch here at the Falconcam, but despite our best efforts we sometimes miss viewing all of the pictures. 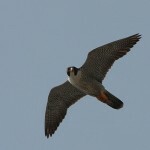 An invaluable tool for catching up or reviewing past images is the Falconcam Archive Viewer. Created by longtime falcon fan Shaky, you can use it not only to view pictures you might have missed, but even to share them with your friends and family. Shaky also has a wealth of Falconcam-related information on his site, so be sure to check it out. With all the hatching activity Shaky’s Archive Viewer is pretty busy today, so don’t be surprised if it takes a while to load, but give it a try! You are currently browsing the Imprints blog archives for May, 2008.